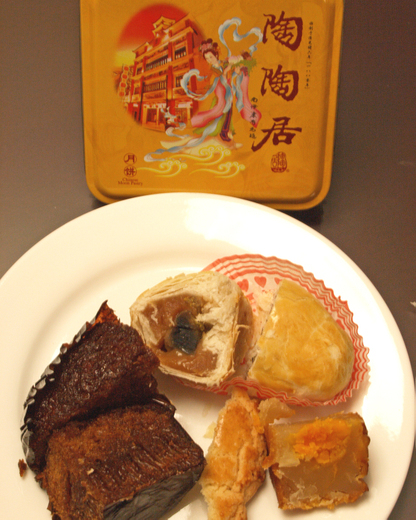 Mooncakes have 1000 evil calories in them, as reported in the Sunday Times two weeks ago. Well, I'm not crazy about them and managed to get by without eating much of it last year so we thought we can safely manage without any this time round, scary newspaper revelation notwithstanding. And we probably would succeed too, if not for the unexpected Parental factor. See, last weekend Daddy and Mummy came down from KL for a brief visit, and as usual, they felt obliged to buy something for the MIL and before we knew it there was a box of them sitting on the dining room sideboard. The fanciful package sat there for two days, quite forlorn and ignored, until yesterday evening when husband took out a piece and cut it into 8 pieces. 125 calories for each tiny segment- taunting, tempting and ultimately, really quite irresistible. Honestly I could not fathom how I ended up eating 3 pieces! Which is, if you think about it, even more calories than a plate of char-kway-teow. So, spell broken, my senses became even more attuned to the mooncake mania and, walking through the shopping centre I found myself gravitating to the stalls to partake of their samples. But telling myself, only if they look and sound appetising, which narrowed down to three. The snowskin versions from Ritz Carlton impressed with their absence of banana essence, Royal China's cranberry snowskin mooncakes were quite delightfully jammy. However, neither excited me enough to purchase for consumption. The exception was Shangri-La's lotus paste with ginseng, classic yet new, thin of skin and light on the sugar, the lotus paste well blended with fine ginseng. A tiny piece left my tastebuds tingling with the long finish of the ginseng's light yet distinct piquancy. It was so good the vendor at the stall diagonally opposite raved about it to her colleagues. I would have bought a box home too, but paused when I saw the $46 price tag. Dearie me, when did mooncakes become so obscenely expensive? So much money for something that will make one forever fat. I could picture in my mind folks in KL exclaiming over this "100+ ringgit mooncakes" extravagance. With that last thought, I walked away firmly,congratulating myself on overcoming temptation. So, four hours later, why am I still thinking about it? Before I go on, I would like also to point out that the Cantonese value another neighbouring cuisine as much as their own, and that is the Chiu Chow/ Teochew style as these two dialect groups are neighbours in the same province. The Chiu Chow style is mainly about minimally tampering with ingredients and emphasis on clear flavours so many dishes are steamed or lightly dressed, very similar to the Cantonese less-is-more philosophy. This is the reason why many Cantonese restaurant have a menu dedicated to Chiu Chow dishes. 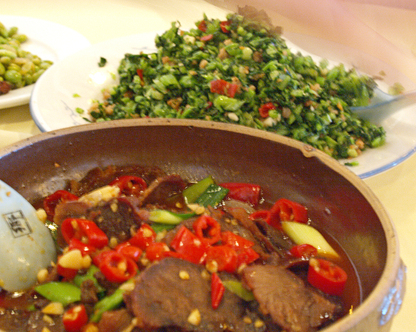 The other Chinese cuisine favoured here is Hunanese food. There are branches of Hunan Home all over the city, one of which happens to be at, surprise!, Victory Plaza. A large room furnished in the trendy canteen style, the restaurant was busy but not crowded the day we visited. It is also staffed by very sweet natured and pretty waitresses who came by often the pinch baby V's chubby cheeks. The food is hearty and rustic, with very deep and in-your-face flavours, the cooks use cloves and other pungent spices with abandon, it is as as homely as Cantonese dishes are sophisticated. Portions are unsurprisingly, rather generous. I was very taken with a humble dish of boiled lotus roots, the lotus root had a pleasing "fan" or fluffy powdery texture instead of the usual crispiness and the flavours were surprisingly meaty either from its inherent composition or the meaty broth it was cooked in. Tender beef in chilli sauce was scattered generously with garlic and chillis, the meat was cooked slow and long in a meaty stock enhanced with plenty of the same garlic and peppers as well as abundant doses of assorted pungent spices. Not too hot if one takes care to shake it free of the garnishes and most of its sauce, this was a perfect accompaniment to steamed white rice and loads of stirfried greens. I could not resist ordering thick crab roe soup and it was a good thing I did. 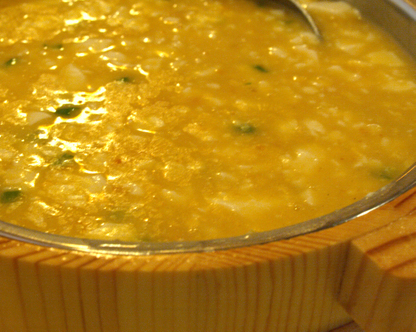 The soup was thick without being too starchy, and inside floated dreamlike pieces of tofu and frilly egg bit. It was similar to thick shark fins soup, with the crab roe flavours cranked up 20 fold, nice if you like crab roe like I do. Of course we couldn't be eating Chinese food all the time. One day my palate just screamed for french fries. Off we went to the neighbourhood around Garden Hotel, and stumbled upon Madison's. We shared a chilli dog and a hamburger between us three adults. The chilli dog was fine if one overlooked the strange choice of an overcrispy sesame roll. The burgers, on the other hand, was an irredeemable failure- the patty was of the frozen horror variety while the fries reeked of heavily recycled oil. A much better place for "western" or at least the Chinese version of "western" was the Greenery Cafe which also has branches all over the city. The menu is very broad ranging, it has flower teas, ice cream shakes, grilled lamb racks, Thai curry with rice and noodles soups. Their french fries were superb, each skinny fry crisp on the outside and fluffy without being hollow inside, good till the very last piece. Everything else we ate and drank were made with obvious care and effort, it is what our own Swensen's and Jack's Place can be like if they only try a little harder. 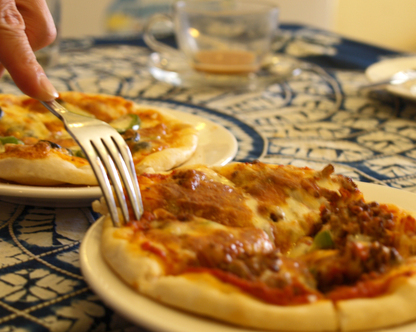 Around the same neighbourhood as Madison's is a tiny pizzeria called Pizzeria. The local magazines wrote that it was started by a hippie and that it was highly popular so we checked it out. The crust was of the thick variety which I am not a fan of, nevertheless the pies were freshly made and not too inedible. 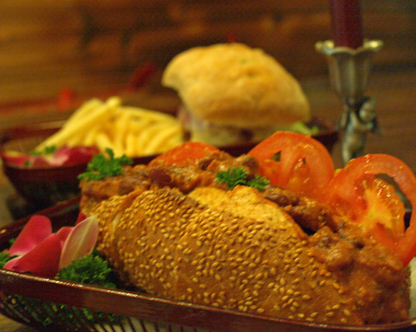 I was surprised to read that Turkish cuisine ranks as one of the top 7 most popular cuisines in the city. Not Szechuan, not Mexican, not Vietnamese, not Korean, but yeah, Turkish. 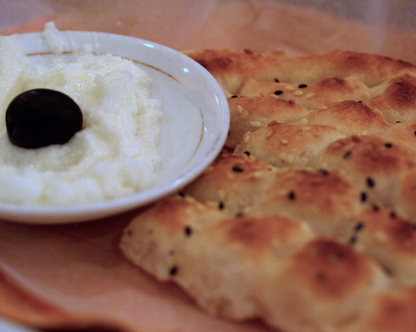 We had to go find out why so we took a taxi across town to Sultan Turkish Restaurant. The restaurant sits between posh La Perle and a Guangzhou Friendship Store. Once we walked through its doors we were instantly transported to the exotic Middle East. Every inch of the walls, floors and ceilings were tiled with mosaic and decorated with more gilt, azure, mirrors, tall backed European style chairs, deep banquettes, cushions and curtains. Middle Eastern customers outnumber Chinese and the restaurant had a vibrant happy vibe much like what I imagine a bazaar to be like as the local Turkish population and their friends gather together for stupendously good Turkish food. I didn't even imagine there are so many Turkish people in China, let alone Guangzhou but there we were, surrounded by middle aged Turkish businessmen and their younger compatriots. Every table was served a complimentary garlicky dip which was very creamy, with garlic sweetness and an unexpected raw finish, this was unstoppably good especially with freshly baked flatbread. Even better was the moutabel, a puree of smoked aubergines. If the garlic dip was unstoppably good, this was practically orgasmic. Creamy and smooth with beads of tiny seeds, the aubergine's sweetness and smokiness was maddeningly addictive. Forget pate and foie gras, give me a plate of moutabel with bread, and I would be more than happy. 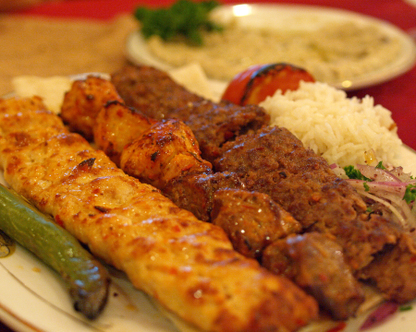 As the restaurant specialises in grilled meats, we ordered a mixed platter of kebabs and were duly impressed. Succulent juicy meats charred in all the right places, with a little mound of nutty rice and a cleansing onion parsley salad on the side, everything got full marks from us. Truly, this place served some of the best Turkish food I've ever eaten, and it was a shame we only discovered the place two days before we had to leave. If I had more time, I would try to eat through the entire menu, and also check out all the other Turkish hangouts in the city. So there we are, if you find yourself in Guangzhou and don't know what to eat, consider trying their Turkish food! Like I said, the only redeeming quality about Guangzhou is its food, especially Cantonese food. 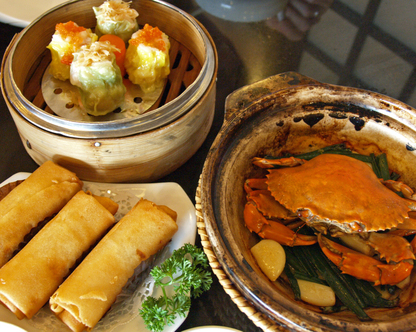 The first meal we ate after we settled into the serviced apartment was dim sum. It was nearly 2 pm by the time we walked across the road to Victory Plaza and found Upday Chao the restaurant recommended by the apartment receptionist. 2 pm is also when the restaurant, like many others in town, offers discounts on its dim sum items. The general opinion was that the dim sum were not as elegant or refined in appearance but more than make up for this deficiency in the taste department. 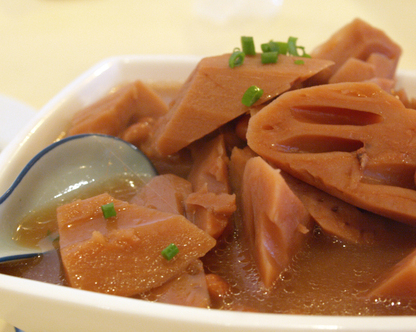 The "pork lard cheong fun", above, exemplified this best. When this plate of nondescript brown rice rolls was placed on our table, I looked quizzically at husband. He said it was listed on the menu as a house specialty. We tried a piece and were surprised at its incredible texture, somewhere in between soft and smooth with an elastic resilient bite. 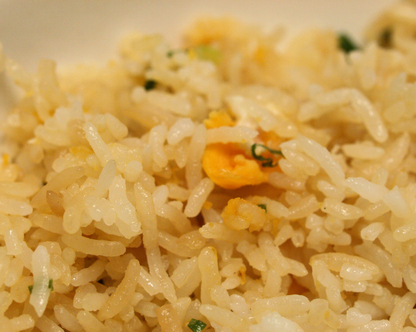 The taste was mainly of soy sauce,a very nice soy sauce with sweet-salty beany nuances, simple yet sophisticated. I was amazed that such a seemingly plain dish could be so exciting, and pretty soon the plate of rolls was polished clean, like within 10 seconds. Later on, I observed that the locals love their rice noodles, whether in dim sum rolls or the ubiquitous stir fried horfun, the latter was the default carbo dish at most of the Cantonese restaurants we later visited. And egg tarts, the ones we ate in Guangzhou were all fabulous, with tremblingly silky, very eggy custard barely held together by a delicate pastry shell that is flaky yet crumbles into almost nothing when bitten into. 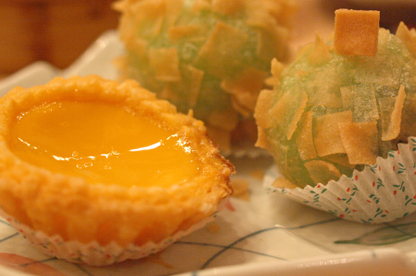 Just like the egg tarts that I used to eat when I was younger, the very old school type, i.e. world apart from today's pallid milky versions. These babies likely involved pork lard in the recipe, and were dangerously addictive. The best version I had was at a seafood restaurant, the well known five storey Dongjiang. A plate comes with 6 pieces and the two of us had absolutely no trouble polishing them off. Upday Chao prides itself on fusion or new wave dim sum, and one particularly outstanding item was mochi balls tinged with bitter melon juice which husband was particularly enamoured of. The melon lent a slight hint of intriguing vegetal bitterness to the skin, lightening its rich sweetness while the crispy wonton skin bits add crunch and novelty. This is the yim yau fan at a typical casual eatery Man Fook Lau that I blogged about earlier. Again, simple food done simply and very well. 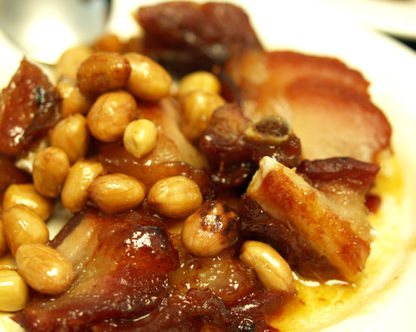 One cannot miss roasted meats in Cantonese restaurants, no? The char-siew at the same place was excellent. Having a baby limited our eating out options quite a bit, as we didn't fancy the idea of travelling all over the highly polluted city in their very dirty and ill-maintained taxies with her. The most convenient solution therefore was to eat at the neighbourhood, i.e. Victory Plaza, restaurants. There are four, of which our favourite remained Upday Chao. Freezone was another option, this is a schizophrenic place as it had waiters dressed in tartan whizzing by on roller skates, tribal-type fixtures on the walls and a menu that covers Japanese, Chinese and Western dishes as well as prominently placed advertisements with Jackie Chan's face on it. The dim sum dishes were sub-standard IMO, but this doesn't matter because the locals go there for their bargain roast pigeons. 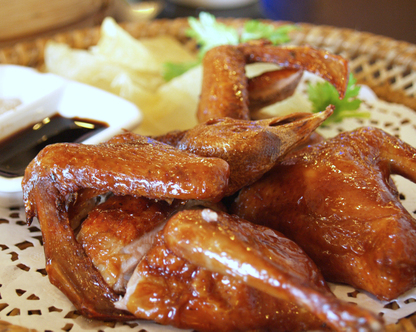 At only RMB10 per bird, every table was munching on the little birds, accompanying them with yep, fried horfun. Only I was silly enough to order their baked crab, which was on a special price promotion, "only 50RMB" the waitress said. But she didn't tell me that this translates to the tiniest crab in the tank. Still, it was tasty enough. 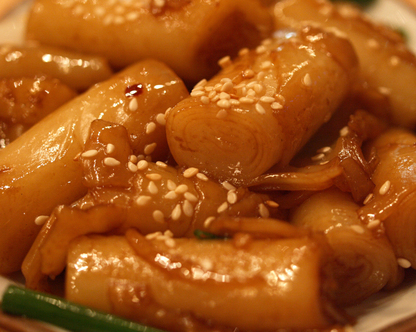 Dou Dou Jun is a name synonymous with Guangzhou cuisine. Their history dates back to the 19th century, and the restaurant is crowded at all times. But the dim sum was terrible, and that is putting it mildly. Everything we tried was cold, lumpy and stodgy, but, very cheap, which may account for its popularity. The thing to eat though, is their pastries. We bought a random selection and everything tasted very fresh and absolutely fantastic. I was at first drawn by their steamed honey cakes, these looked so inviting with their dark honeycomb cross-sections, and I overheard another lady telling her friend how much she loved them. She was right, the sponge was soft yet springy and the burnt sugar taste was nicely rounded. The popular "kai jai peng" or chicken biscuits were amazing, redolent of dried sausage meatiness and beautifully short yet crisp to bite, so sinful and so bad for you yet so irresistable. Century egg pastries was exemplary too, with the perfect pastry skin that is ever so flakey and dissolves meltingly in the mouth as it should be. "Hap tho so" or walnut cookies were faultless too, one bite and I was transported to my childhood when Chinese bakeries habitually used butter and lard instead of nonsense like margarines, flavourings and stabilisers. 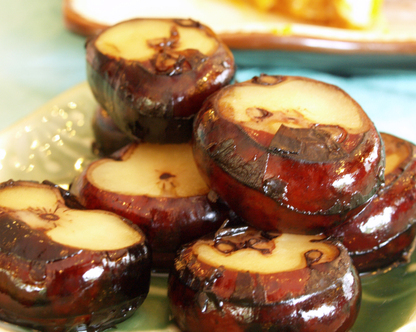 Above: water chestnuts doused with a light syrup. This was an appetiser dish at the five storey Dongjiang seafood palace. They have all sorts of live sea creatures, even water beetles! We opted for less complicated dishes like braised tofu. 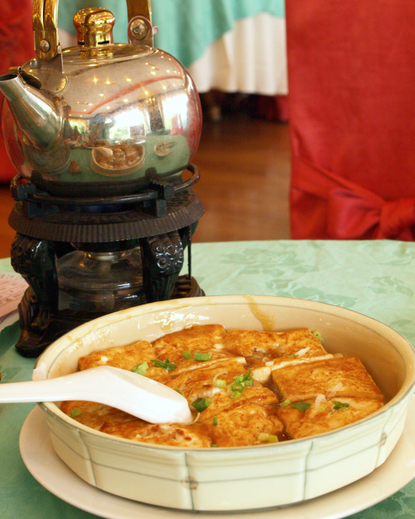 The tofu tasted really fresh and sweet, the braising sauce coating it lightly yet not overpowering its natural flavours. 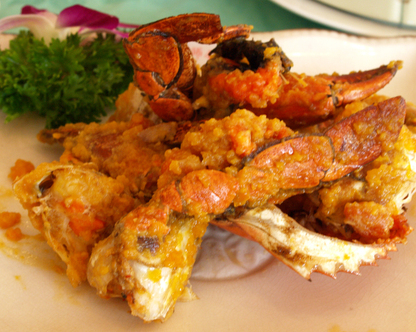 Crab with salted egg yolk. One could have it steamed of course, but we chose to live dangerously. Worth every finger-licking bite. We also ate at popular chain outlets like Gongfu, Cafe de Coral and Greenery Cafe, all excellent options for low to mid-priced eating. Another place we didn't try was Bellagio Cafe, a Taiwanese chain, but I went to one outlet in Beijing and enjoyed my experience- their lu rou fan was especially tasty. There are too many eating options in this big bad place, 10 days is just enough to get but a mere glimpse. In my next post, I will touch on other gastronomical possibilities. Finally uploaded pictures of food and baby onto Flickr (or click icon on right sidebar). Baby pictures are in a private set, you will need to register and add me as a contact, the system will notify me so I can Ok you as either a friend or family and you can then view the pictures. We returned to Singapore last evening. Back at the office today to sort out last minute stuff for tomorrow's work trip to Beijing.